The state an war Banner o San Marino is formed bi twa equal horizontal baunds o white (top) an licht blue wi the naitional coat o airms superimposed in the center; the coat o airms haes a shield (featurin three touers on three peaks) flanked bi a wreath, belaw a croun an abuin a scroll bearin the wird LIBERTAS (Liberty). The civil banner omits the coat o airms. Wikimedia Commons haes media relatit tae Banner o San Marino. 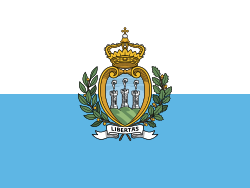 Wikimedia Commons haes media relatit tae Flags of San Marino.